The entire crew of the cargo ship that sideswiped a bridge, causing San Francisco Bay's worst oil spill in nearly two decades, has been detained as part of a criminal investigation, a Coast Guard official said Sunday. Capt. William Uberti said he notified the U.S. attorney's office on Saturday about issues involving management and communication among members of the bridge crew: the helmsman, the watch officer, the ship's master and the pilot. The entire crew of the Cosco Busan, which disgorged 58,000 gallons of oil into the Bay on Wednesday, is being detained on the ship for questioning, said Uberti, head of the Coast Guard for Northern California. Uberti declined to specify what problems he reported. A call to that office was not returned Sunday. A preliminary Coast Guard investigation found that human error, not mechanical failure, caused the ship to crash into a support on the San Francisco-Oakland Bay Bridge. The wreck left a gash nearly 100 feet long on the side of the 926-foot vessel and ruptured two of the vessel's fuel tanks, causing heavy bunker fuel to leak into the bay. The spill has killed dozens of sea birds and spurred the closure of nearly two dozen beaches and piers. A language barrier between the vessel's pilot, Capt. John Cota, and the ship's all-Chinese crew was not likely a factor in the crash, since the ship's captain and officers are required to speak English, officials said. The National Transportation Safety Board arrived Sunday to launch its own investigation. The agency will look at everything from how fatigued the ship's crew and captain were to any mechanical or weather issues that may have been involved in the accident, said Debbie Hersman, an NTSB spokeswoman. The NTSB's investigation, expected to take up to a year, also will examine the initial response by the Coast Guard and the company who owns the vessel, she said. Hersman would not say whether the NTSB's inspectors would aid federal prosecutors, but did say her agency would cooperate with all parallel inquiries. The Coast Guard has come under criticism because of a lag of several hours between when agency officials learned that the spill was thousands of gallons, not 140 as initially reported, and when that information was given to local officials and the public. U.S. Sen. Dianne Feinstein, D-Calif., and Sen. Barbara Boxer, D-Calif., have both called for swift and thorough investigations of the spill, and Gov. Arnold Schwarzenegger has declared a state of emergency. Feinstein met with Coast Guard officials Sunday and said the system for responding to spills needed to be improved, especially communication with communities where toxic sludge began washing up on beaches shortly after the crash. "There were a lot of unusual things such as weather, but that should not excuse this," Feinstein said. "It's clear that the cities around the bay should have been brought into this faster than they were." 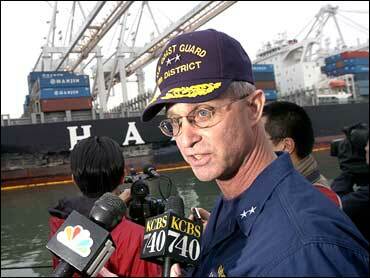 The head of the Coast Guard defended his agency's response. "On the surface it would appear that we did everything by the book in this case as far as responding," Allen said. He said preliminary information suggests it took time to figure out the extent of the spill partly because sounding tubes used to measure how much fuel is in the oil tank were damaged in the crash. To accurately measure the extent of a spill officials must measure how much fuel is left in the tanks, he said. Efforts to clean up the mess intensified over the weekend. The Coast Guard increased the number of ships to 20 from 11 to work on skimming the oil from the bay, said Petty Officer Sherri Eng. Nearly 20,000 gallons of oily liquid had been sucked up so far, and about 770 workers have taken part in cleanup efforts on the water and along beaches to mop up the damage, a job that is expected to last weeks or possibly months. Rescue teams raced to save hundreds of seabirds tarred with black shipping fuel. At least 60 birds were found dead while 200 live birds were recovered and sent to a rehabilitation center in Solano County. The National Park Service reported Sunday that thick balls of oil had been discovered on the pristine shoreline of Point Reyes National Seashore along the Pacific coast. The oil has put several sensitive and threatened species at risk, according to the park service, including western snowy plovers, brown pelicans and several seal species.